I am acutely aware of all the ways in which hot anime boy rhythm game Uta No Prince Sama: Shining Live is pandering to me, and all the ways it is trying to gouge me for money. It’s still got its hooks in me. Uta No Prince Sama: Shining Live is a rhythm game that’s just made its debut in English. It’s from the developers of Love Live, and it’s pretty similar to that cute anime girl gacha game. This time it’s cute anime boys. You collect different cards of characters, who each have different skills to boost your score or health. The more powerful cards are, of course, the most rare, and you need to spend a currency called Prisms to pull more cards in a random lottery. You can earn Prisms by playing the rhythm game or by buying them. You’ll probably only end up with a few cards you can really use, but you can use the junk cards to level up your main ones. Like Love Live, Uta No Prince Sama also has a tie-in anime. There is nothing in this game that isn’t either predatory or pandering. When you first start it up, you’re asked to pick a favorite guy, who will greet you and talk to you every time you open the game or visit the main menu. He comments on how late you’ve stayed up or tells you to stay focused. If you tap him, he talks more. Sometimes he’ll say that it tickles. By unlocking each character’s side stories—short visual novel portions where they talk about things like what they like to cook or their hobbies—you can also earn new clothes for them and change their outfits. They’re Ken dolls, but they talk back, and are vaguely horny. My cute anime boy of choice, the ladykilling Ren, calls me “princess” and “lady.” Is it corny? Definitely! But that undivided attention is appealing. 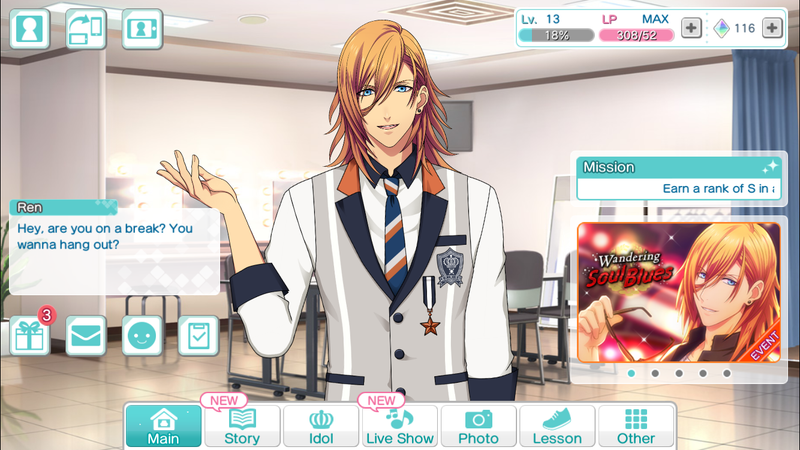 I know I’m being played, but when I idle on the main menu for too long and Ren says, “Hey, what’s with all the staring?” while tossing his hair, it brings me back to being an obsessive fan of ‘Nsync. When I was in my early teens, I also thought my hot boyband guy of choice, JC Chasez, was singing directly to me. Uta No Prince Sama is a fictional recreation of that experience that’s also more real. Ren only exists inside my phone screen, but unlike Chasez, who is a real person with his own desires, there isn’t anything more to Ren than making me happy. Uta No Prince Sama is charming. Getting to those charming moments means playing, and being good at, the rhythm game. The rhythm game is fun and challenging, and I really enjoy playing it even if the songs are pretty cheesy. You arrange your hands at the bottom of the screen and tap at dots as they fly past your fingers, in patterns that range in speed and difficulty. No matter how good you are at tapping dots, you won’t get high scores if you don’t have powerful cards. You can pull new cards either one at a time for 30 Prisms or in groups of 11 for 300 Prisms. Statistically speaking, solo pulls aren’t worth it, and you’ll always be trying to save up 300 Prisms for the chance at getting a rare and powerful hot anime guy. Right now I’m earning Prisms at a steady pace, but if Uta No Prince Sama is anything like Love Live, soon the game will stop handing out Prisms quite so freely. If I wanted to just buy enough Prisms to pull 11 new boys, it would cost $25. When I saw that price, I laughed. Despite my initial skepticism, I had a brief vision of myself buying Prisms. In fact, when I was a few Prisms short of 300 and wanted to go to sleep instead of grinding, I almost did buy some. I know what this game is doing. I know I’m being manipulated. I know the end goal is for me to pay $25 for hot anime boys. Right now, I think I’m okay with just the parts of the game I can get for free—the corny songs, the canned lines from Ren, dressing up my guys, and tapping all those dots. Even more than that, I know that the game is trying to sell me intimacy. I don’t know whether or not I am willing to pay for it.